It’s no secret that Kris and I have been playing a lot of Mario Kart 8 Deluxe. I remember I didn’t play Mario Kart 8 as often when it came out because I still loved Mario Kart Wii. Mario Kart 8 Deluxe is a great game and I forgot how wonderful 8 was until now. So, here are my favorite Mario Kart games! Since this game came out for the SNES, I’ll admit that I don’t remember it as much as I think I should. Still, it’s one of my favorites because it was, of course, the first one. I remember playing this game with Kris at our grandparents’ house. I wasn’t great at the game because I was so young, but I still enjoyed it all the same. I wasn’t sure how I liked a Mario Kart game on the handheld because I was so used to it being on the big screen with a console. Plus, it was harder to play with friends. It’s still one of my favorites though because I enjoyed the game a lot and I used to bring my 3DS to babysit and the kids and I would play together. I have fond memories of this game. Kris and I played this together all the time. She’d be Daisy, I’d be Yoshi. She’d drive, and I’d throw all the items. We made a great team. And the fact that Nintendo made a Kart racing game with such a mechanic is awesome. I hope they bring that back a different racing mode or something someday. Like I stated in my intro, Mario Kart Wii has always been my favorite. I loved the physical steering of the remote, the courses were unique and awesome, and Rainbow Road was just fantastic. Plus, I rarely lose at that game, so that’s definitely a plus. This one will always have a special place in my heart. Sorry, Mario Kart Wii… The updated Mario Kart 8 Deluxe has beaten you. Between the various kart, wheel, and paraglider combinations, updated courses (including the DLC), various courses, and (my favorite) 200cc mode, I felt 8 Deluxe had to take over the number one spot. I feel like I’m cheating on the Wii version, but… what can I say? Technology, especially for the Nintendo Switch, just keeps getting better and better. 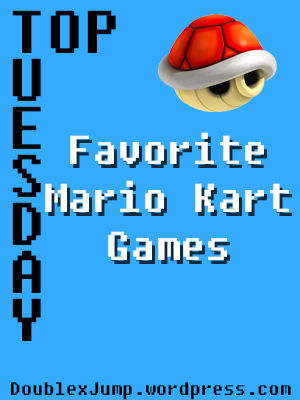 What’s you favorite Mario Kart game? Let me know in the comments below! 2. Mario Kart 64 – This is very nostalgia-driven, but I loved this game growing up. The Battle Mode here is still my favorite. I also loved Rainbow Road, even though races took forever on it. 1. Mario Kart 8 Deluxe – It’s such an ultimate version that includes so many elements from the older games. Plus there are crossover characters, which makes me happy. We do still have to play… we’ve just been so busy, lol.